FIX DRIPS - A dripping faucet can send 20 gallons of water down the drain every day. CHECK LEAKS - Use a drop of food coloring in the tank to spot a toilet leak. Toilet leaks can add up to 200 gallons a day. FULL-HOUSE LEAK CHECK - Turn off all faucets and water using appliances then check your water meter. Many meters like the one shown here have a small red triangular leak indicator. If it is spinning when everything is turned off, you have a leak. If your meter does not have an indicator, take a meter reading then wait an hour. Check the meter again and see if the dial has moved. GO LOW-FLOW - Replacing an old shower head with a low-flow model can cut water use during showers by about 20%. WASH SMART - Use the appropriate water level and load size on your washing machine when doing laundry. UPDATE APPLIANCES - When it is time to replace your appliances get a water-efficient dishwasher or a low water use front-loading washing machine. NEW TOILETS - Replace older model toilets with new low-flush models. 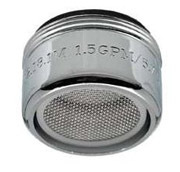 SLOW THE FLOW - Inexpensive faucet aerators can save gallons of water per day. ADJUST MOWER - Set lawn mower one notch higher. Longer grass helps hold in moisture. WATER WISELY - Measure lawn sprinkler output and only water when needed. Water early in the day. Avoid watering at mid-day or when the wind is very high. COVER THE POOL - A pool cover reduces evaporation and can save 250 gallons a week. SPARKLING CAR - Use a pistol grip nozzle to keep your water hose from running while you are washing a car, boat or patio furniture. Consider using a commercial car wash that recycles water.